Latuff is a riot. 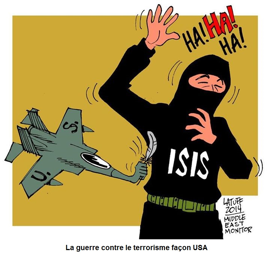 US and ISIS – best friends forever. Divided in politics, but united at heart. A commander of Iraq’s popular forces disclosed that wiretapping of ISIL’s communications has confirmed the reports that the US planes have been airdropping food and arms supplies for the Takfiri terrorists.“The wiretapped ISIL communications by Iraqi popular forces have revealed that the US planes have been dropping weapons and foodstuff for the Takfiri terrorist group,” Commander of Iraq’s Ali Akbar Battalion told FNA on Wednesday. All wars are for conquest and based on deception. ISIS will not disappear until they are no longer useful. Next What if every day were Christmas?